The Legendary LEONARD COHEN discovered singer/songwriter JOANELLE ROMERO. 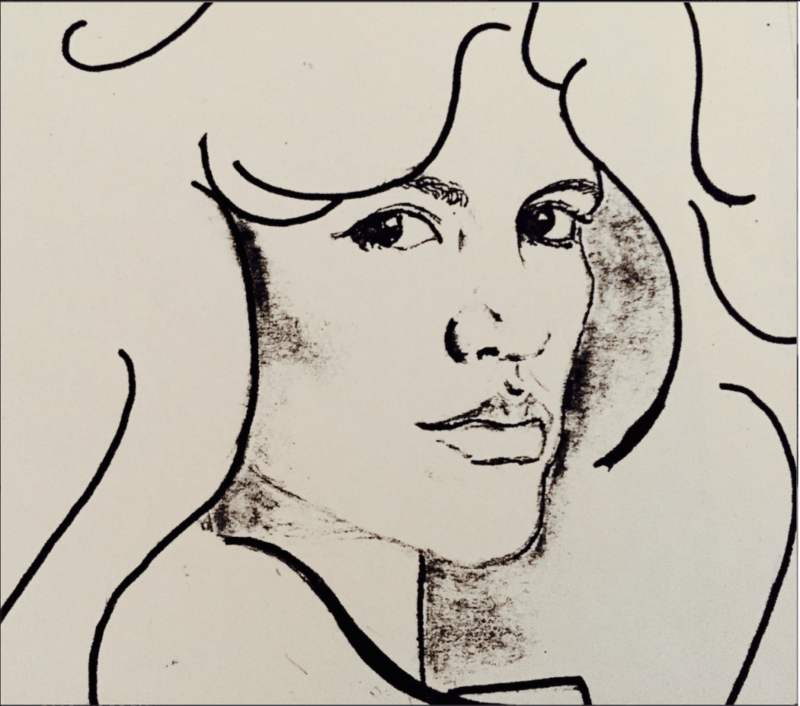 Joanelle Romero is the first female artist that Leonard Cohen produced. 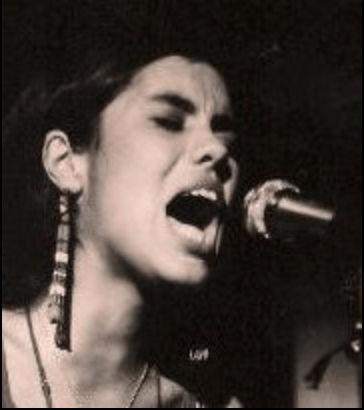 Leonard Cohen produced her first demo at A&M Records; JOANELLE was the only American Indian recording artist on the world’s famous Sarah McLaughlin “Lilith Fair Tour” with Sara McLaughlin, Sinead O’Connor, the Indigo Girls and Natalie Merchant; first all female tour; before being asked to join the “Lilith Fair” JOANELLE launched NATIVE WOMEN IN MUSIC concert series. July 5 & 6. 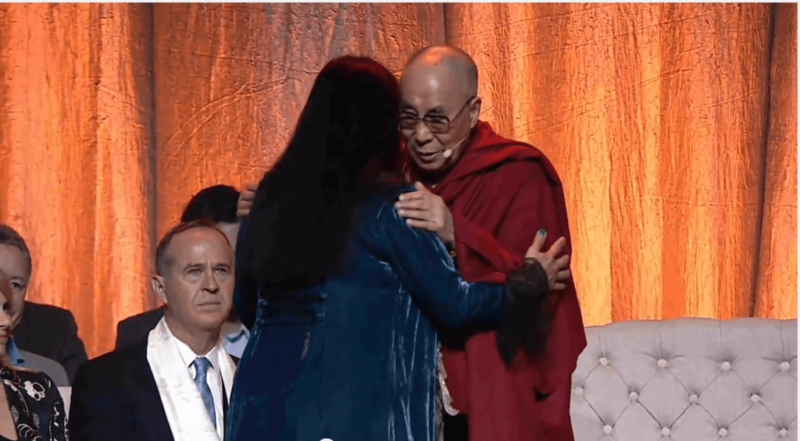 2015, JOANELLE had the honor and was asked to speak on half of Indigenous Women and Sacred Water of Life as well as sing traditional songs for His Holiness the 14th Dalai Lama on his 80th Birthday at the Honda Center. JOANELLE has since went on and created the only American Indian record label in Los Angeles with 38 categories in entry level of Grammy nominations for consideration. A classically trained vocalist, her powerful political lyrics portray the struggle of American Indian people today. The song “I NEED A MAN” made her the most requested Indian blues singer. JOANELLE ROMERO is recording her long awaited “INDIAN COUNTRY BLUES” album to be released fall of 2016. This LP is scheduled to released in 185 markets by Mr. Blues man himself Dan Aykroyd. Her POP single, “Come and Get your Love Boy” the premier single co-written by JOANELLE ROMERO and Ron Tyson; produced by Ron Tyson of The Temptations has cleared the first round of Grammy Nominations 2002 in four categories. Record of the Year, Song of the Year, Best New Artist, Best Pop Female Performance. The first time any music by any American Indian has been so successful. As a recording artist Joanelle Romero brings the passion of, and for her people to the foreground of her music. The rich tapestry of her ethnic makeup of Mescalero-Chiricahua Apache/Navajo/Southern Ute/Paiute/Cheyenne Nations/ SpanishJew-Sephardic . Pawnee, Pojoaque by marriage and Oneida Iroquois family relations which weaves though Joanelle’s creative process and her music. Joanelle Romero is a classically trained vocalist exploring new frontiers in contemporary music, and while she continues to push creative boundaries, her music remains very accessible. 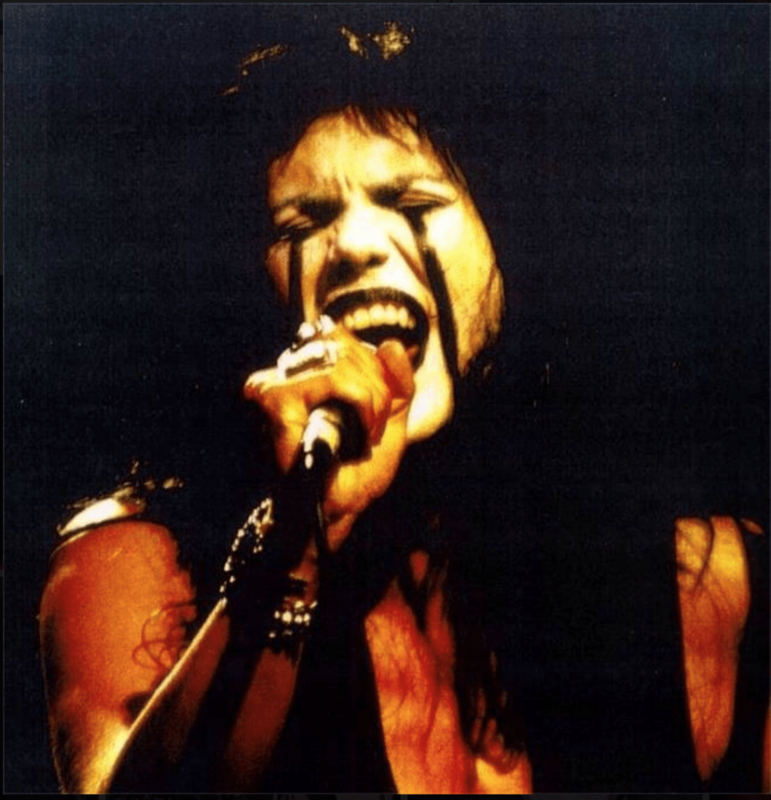 In addition, she has opened for notable artists as Rick Danko of The Band, Kris Kristofferson, Stevie Wonder, Eric Anderson, John Trudell, Paul Butterfield, Tin Machine, Freddie Fender, Ritchie Havens and Roseanne Cash. Joanelle has been asked to sing Traditional Blessings Spiritual songs for such notables as Jane Goodall, Cesar Chavez National Holidays, Gandhi’s Grandson Peace Day, Earth Day Celebrations, Gandhi’s Grandson Peace Day, to name a few. BILLBOARD MAGAZINE featured ROMERO prominently in the first-ever special issue focusing on contemporary American Indian music. 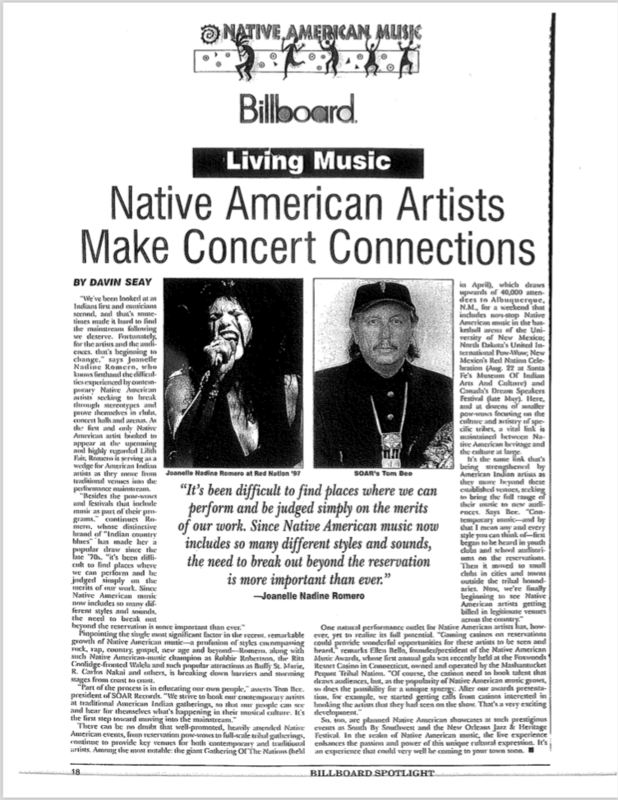 Since then Billboard Magazine has included JOANELLE ROMERO in every summer issue in their Native American Music interviews. As a young girl, she would hang out on the MGM lot with the King himself, Elvis Presley and sang with Dr. John & The Night Trippers (at age nine), Paul Butterfield, Rick Danko and Richard Manuel from The Band, Tommy Kaye, Gene Clark from the Byrds, Jesse Ed Davis, Randy Castillo, Solomon Burke (Joanelle’s God-father) and the Legendary Leonard Cohen. These mentors and friends of Joanelle have been some of the most important recording artists whose legendary achievements stand as hallmarks in the music industry: Their advice, tastes and knowledge were passed on to her. These friends inspired and influenced her not only to continue her music and mission but they have profoundly shaped how she creates her sound and writes her lyrics. While Joanelle Romero’s music is culturally charged, its themes and songs are universal. Joanelle Romero’s mission is to ensure that the next generation of American Indian artists have their image and sound in the entertainment industries so that they will have something to relate to and have goals that they may continue to strive toward. Leonard Cohen, Henry Louie, Rossco Beck, Richard T. Bear, Kyle Johnson, Oli Pierce, Lolly Vegas, Ron Tyson of The Temptations. 2005 – ENTRY LEVEL first round in GRAMMY AWARD CONSIDERATION 2005 FOR THE BEST OF JOANELLE ROMERO LP in 10 Categories including Music video short form. Producers: Leonard Cohen, Henry Louie, Rossco Beck, Oji Pierece, Ron Tyson, Klye Johnson, Richard T. Bear, and Billy The Kid. 2004 – Cleared 13 categories – in the first round of Entry in Grammy Nominations, and featuring JOANELLE ROMERO for “The 8th Annual Red Nation Celebration Concert Series EAST COAST WEST COAST – Double CD, recorded LIVE at The Bitter End in New York City during the Grammy week and at The John Anson Ford Theatre in Los Angeles for their summer season. Producer: Joanelle Romero. 2003 – Introduction by DAN AYKROYD & featuring Joanelle Romero; cleared 10 categories in Grammy nomination consideration in 2003 for: Album of the Year, Rock Album, Best Recording Package, Producer of the Year, Best Engineering Non-Classical Album, Record of the Year, Song of the Year, Best New Artist, Rock-Female Vocal Solo, Rock Song. In addition on this album JOANELLE ROMERO cleared 5 categories for title songs: “Thunder In The River” for: Song of the Year, Best New Artist, Rock – Female Vocal Solo, Rock Song. Producer: Joanelle Romero. 2003 – Joanelle Romero cleared the Native American category for the first time since she founded her record label Red Nation Records. 2002 – Joanelle’s Pop Contemporary single “Come and Get Your Love Boy” was considered in 4 categories for: Record of the Year, Song of the Year, Best New Artist and Best Female Pop Performance in 2002. This single was co-produced by Joanelle Romero, Grammy Winner Ron Tyson of “The Temptations,” Oji Pierce, and Lolly Vegas. 2002 – “The 5th Annual Red Nation Celebration LIVE 2001,” and featuring JOANELLE ROMERO, cleared first round in Grammy Nominations 2002 for “Best Engineered Album, Non-Classical. Producer: Joanelle Romero. 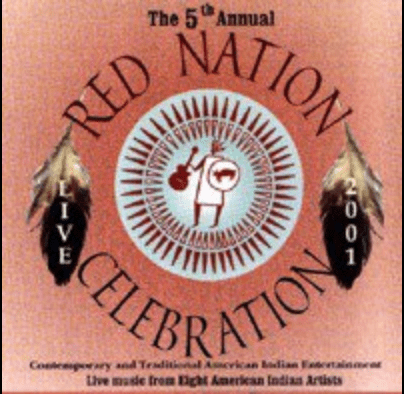 2002 – “The 5th Annual Red Nation Celebration LIVE 2001,” and featuring JOANELLE ROMERO. This album was nominated for a NAMMY Award: American Indian Music Award. Producer: Joanelle Romero. 2002 to 2005 – 38 categories in Grammy Considerations. Never before has an American Indian recording artist with her own label RED NATION RECORDS; cleared this many categories in Grammy considerations. Joanelle Romero is the first American Indian Recording Artist & Producer (to date) to clear the first round entry in five categories in the Grammy Awards 2002, 10 categories 2003, 13 categories in 2004, and 10 categories in 2005. The only American Indian artist to be discovered and produced by Legendary Songwriter/poet Leonard Cohen. First American Indian musician to fuse American Indian drum with Rock and Roll. 2005 – Cleared 10 categories in the first round of the Grammy Nominations; including first time consideration in Best Short Form Music Video. 2004 – Cleared 13 categories in the first round of the Grammy Nominations; including first time consideration in the Native American category. 2002 – Nominated for a NAMMY AWARD for album “The 5th Annual Red Nation Celebration Concert Series – LIVE at The Hollywood Palace. 2002 – Romero started a music movement in Los Angeles “An Acoustic Evening with American Indian Songwriters & Poets” Joanelle felt that American Indian music needs to be in the forefront of the music industry. 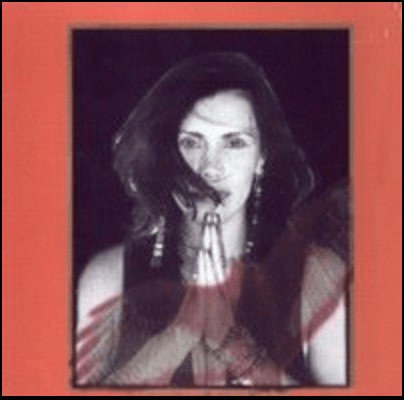 1998 – Joanelle Romero was the only American Indian recording artist to perform on the Lilith Fair with Sara McLaughlin, Sinead O’Connor, the Indigo Girls and Natalie Merchant; first all female tour. 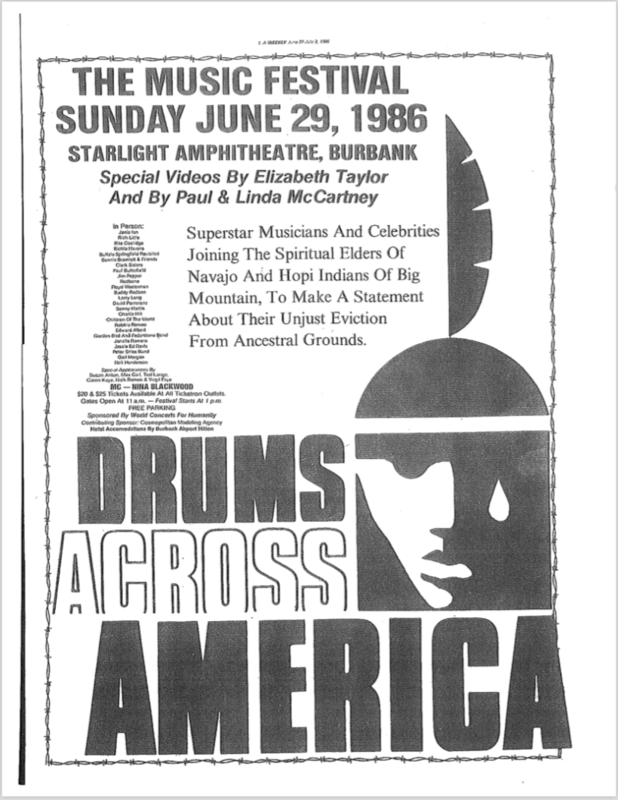 1995 – Founded “The Annual Red Nation Celebration Concert Series” premiering the Best in Contemporary and Traditional American Indian Entertainment. Produced annually during the Grammy week 2005 Red Nation Celebrating 10 Years Excellence in Education Arts Culture. 1995 – Joanelle Romero formed REDHAWK, an American Indian band that represents the Nations of Apache, Choctaw, and Cherokee, Cheyenne, Zuni, Creek and Seminole tribes. 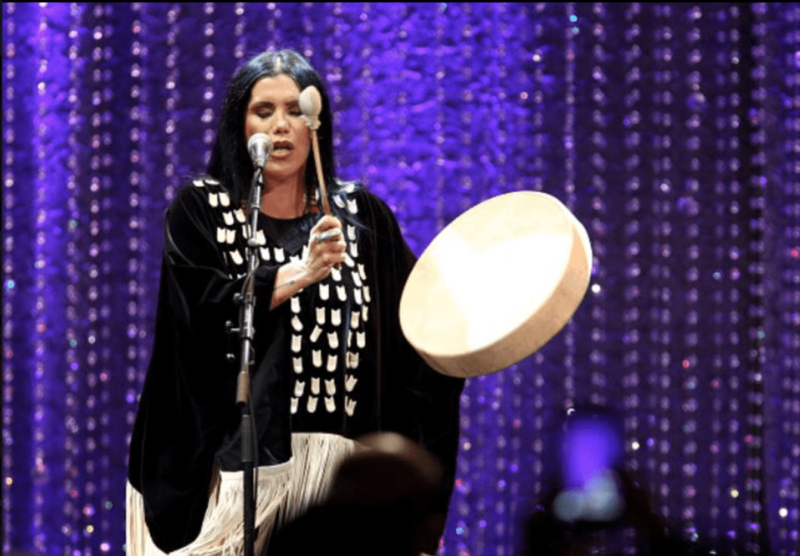 1979 – First American Indian female musician to fuse Traditional drum with Rock and Roll. She performed this new sound in Rock & Roll at a private party. Some of the people who heard this new sound for the first time were: Jackson Brown, Tim Hardin, Gene Clarke from the Byrds, John Barrymore Jr. to name a few. Romero’s music has been featured in Rockin’ Warriors a documentary film produced in Luxemburg for U.S. This film was broadcast in Europe and aired on the Ovation Network and the Arts Channel. Her music can be heard in such films as Vendetta, a Roger Corman film, A PBS Series POSITIVE: Life With H.I.V. (broadcast nationally in 1996) and her title song in the award-winning film American Holocaust: When It’s All Over I’ll Still Bee Indian. Ms. Romero’s music videos have won in film festivals across the country and currently being seen on Canadian television. Grammy Consideration – music video 2005. * Climate Change International Conference / July 2008. 2003 – “The 8th Annual Red Nation Celebration Concert Series EAST COAST WEST COAST” Double album Producer Joanelle Romero. Cleared 13 categories in the first round of 2004 Grammy nomination consideration for Record of the Year (2 songs), Best New Artist (2 artists), Country Female, Country Song, Album of the Year, Best Native American Album, Best Record Package, Best Engineer-Non-Classical and for 3 songs for Producer of the Year. 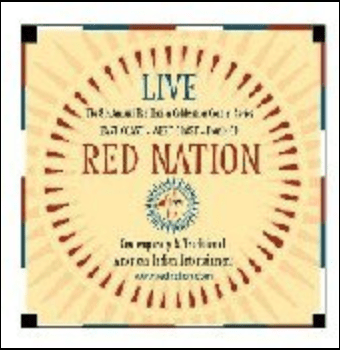 A first for The Annual Red Nation Celebration Concert Series Album was considered for nomination in Native American category. This album was recorded LIVE at The Bitter End in New York City during Grammy Week and at The John Anson Ford Theatre in Los Angeles during summer season. 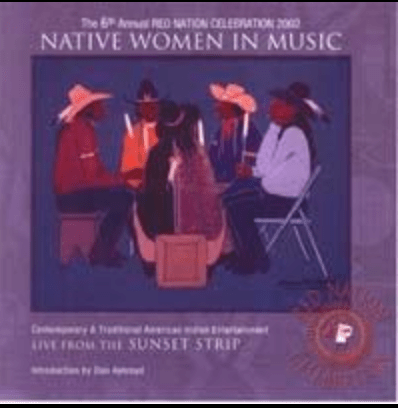 2002 – “The 6th Annual Red Nation Celebration Concert Series LIVE from the Sunset Strip Native Women In Music – Introduction by DAN AYKROYD” album Producers Joanelle Romero and Gail Sanchez. Cleared 10 categories in the first round of 2003 Grammy nomination consideration for Album of the Year, Rock Album, Best Recording Package, Producer of the Year, Best Engineering Non-Classical Album, Record of the Year, Song of the Year, Best New Artist, Rock-Female Vocal Solo and Rock Song. 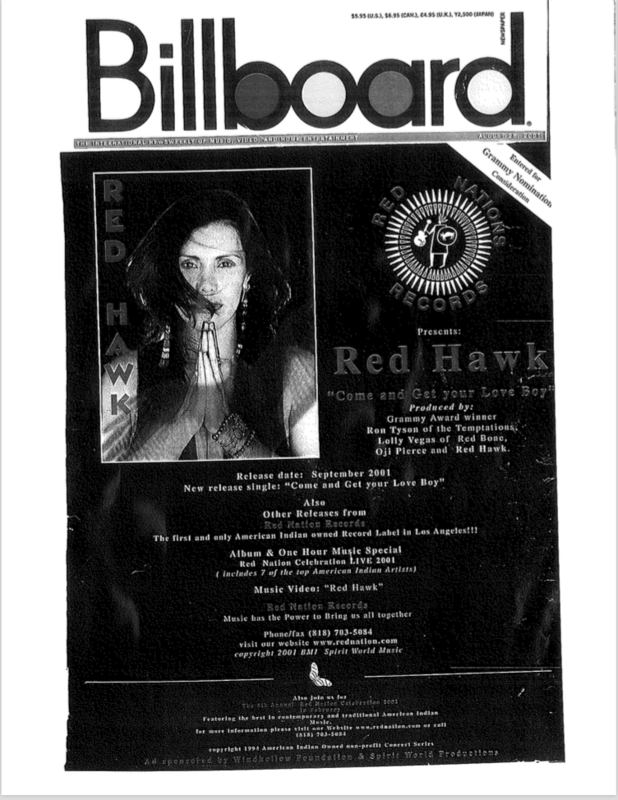 2001 – “RedHawk – Come and Get Your Love Boy”, single Producers Ron Tyson, Oji Pieacre, Lolly Vegas and Joanelle Romero. Cleared five categories in the first round of 2002 Grammy nomination consideration for Record of the Year, Song of the Year, Best New Artist, Best Pop Female Performance and Best Non-Classical Album. 2001 – “The 5th Annual Red Nation Celebration Concert Series LIVE at The Hollywood Palace.” album Producers RedHawk, Teddy Parker, Gail Sanchez and Steve Boggess. Cleared category in the first round of 2002 Grammy nomination consideration for Best Engineered Non-Classical Album and nominated for a NAMMY Award. 1997 – “American Holocaust: When It’s All Over I’ll Still Be Indian” 3 song CD. Producers Kyle Johnson, Joanelle Romero. 1994 – “Indian Country Blues” First album. Producers Kyle Johnson and Joanelle Romero. 1988 – “I Feel Like A Woman for The First Time” a and b side. Producers Henry Louie and Rosco Beck. 1984 – “Make No Bones” vinyl record a and b side. Produced by Richard T. Bear. 1979 – “Hey That’s No Way to Say Goodbye” Including Romero’s first songs professionally recorded at A& M Records. 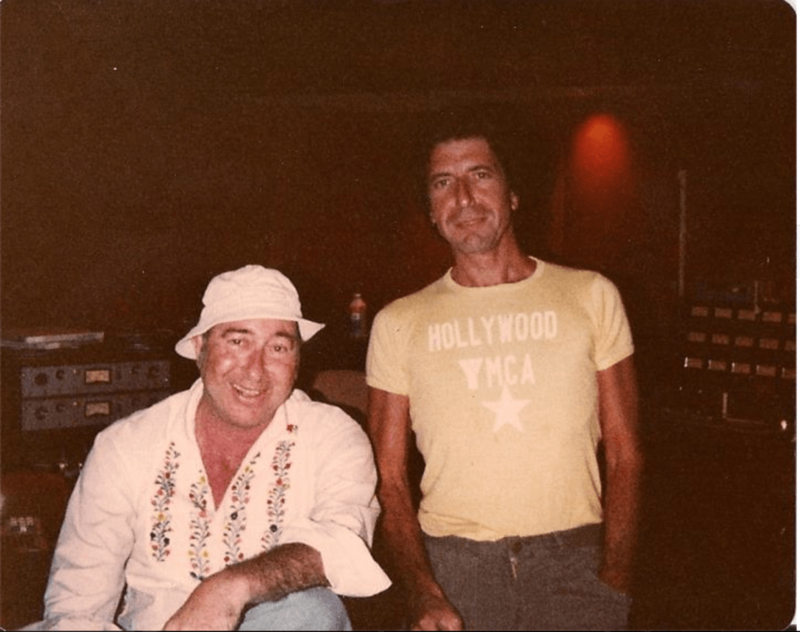 Producer Leonard Cohen. This was the first time Romero had ever been in the recording studio with her songs. The World’s Leading American Indian Record Label – Rooted In Indian Country. This label is the only American Indian label based in Los Angeles, founded by Joanelle Romero in 2001. Romero’s motto: “MUSIC HAS THE POWER TO BRING US ALL TOGETHER” Where is our image in film, television and radio? 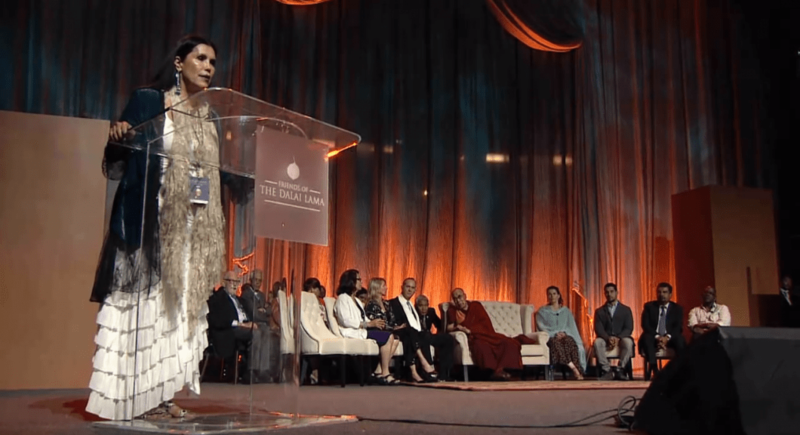 Romero’s passion and mission with her companies is to make sure that American Indian become mainstream on prime time television, radio and film as contemporary human beings. All companies are American Indian owned.